Hi! I'm Ruthy and I love finding pre-loved treasure. My tastes tend to reflect the fact that I'm a child of the 1970s, but there is stuff from earlier and later in the 20th century that appeals to me too. As well as being more fun, and cheaper, I think buying second-hand is more environmentally-friendly. I really enjoyed being Finder of the Fair! It gave me the perfect excuse to choose lots of things I like, without necessarily having to buy them all. 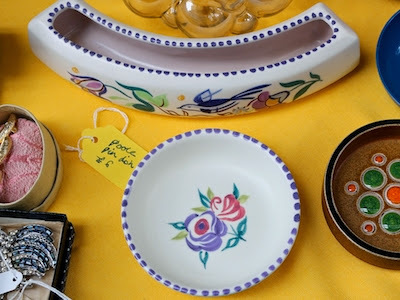 My husband is a minimalist, and we're on a tight budget, which means I have to be fairly restrained in my purchases... All the stall-holders were very friendly and happy to talk about the items on their stalls. I write about buying second-hand, and other stuff I enjoy doing, on my Minibreak Mummy blog. 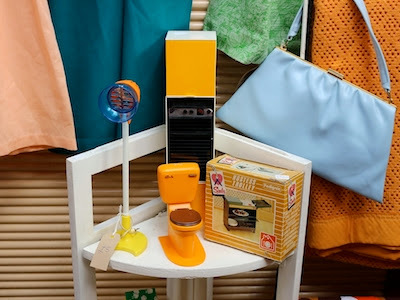 I wrote a recent blogpost about the Vintage Village. But with a full-time job and a 6 year old son, I'm a fairly sporadic blogger! I'm also on Twitter and Instragram as 'nyssapod'. 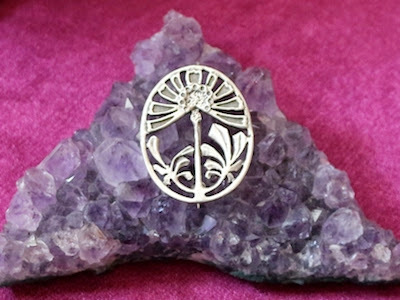 This pretty little Art Nouveau brooch came from Baboushka's Silver. It turns out that the owner of this stall is a fellow Kate Bush fan! 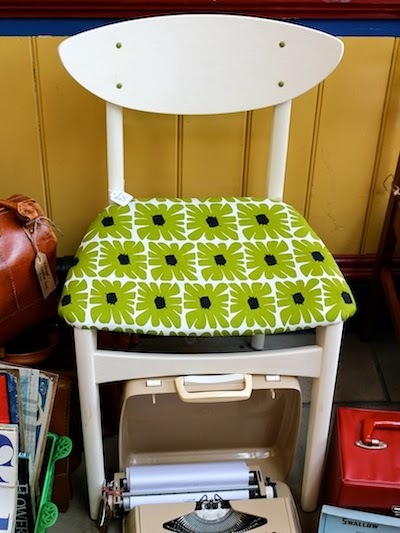 I loved this chair, which was painted white and upholstered in a funky green print fabric. This would look great with a white-painted dressing table. I took lots of photos on the Boomerang Vintage & Retro stall, but in the end decided my absolute favourite was this gorgeous tea set with a very retro turquoise and royal blue pattern. 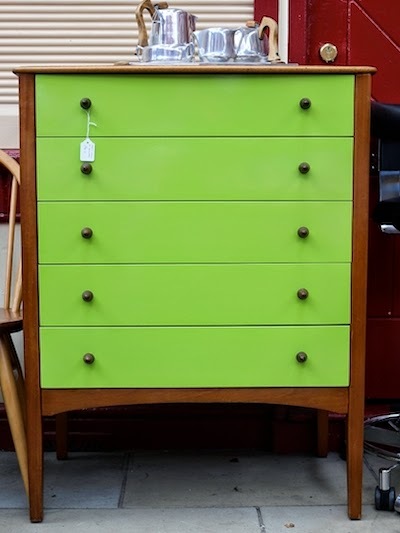 One of my favourite finds of the fair was this teak chest of drawers with the drawers painted a beautiful lime green. I love this style of furniture and will definitely be keeping an eye on Whittaker & Gray to see whether they have anything else I like. 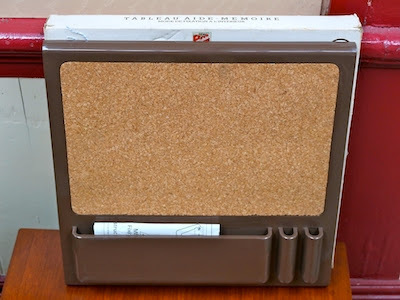 I was very taken with this brown cork and plastic memo board. It would have gone perfectly in my old orange and brown kitchen! 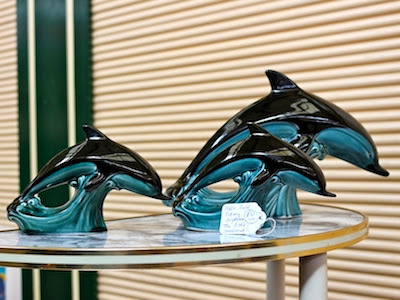 Modernist Mid-Century had a fantastic family of Poole dolphins for sale. These would look really lovely displayed on a 1950s room-divider. 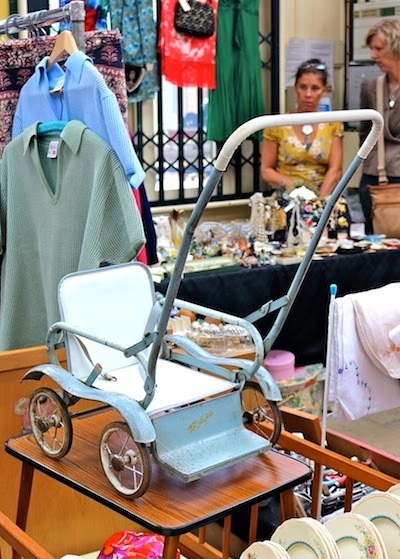 Taking pride of place on the Make Do and Mend stall was this vintage toy push chair, perfect for pushing a vintage doll around the park. My six-year-old was extremely impressed with this Sindy toilet on the Diana Black Vintage stall. 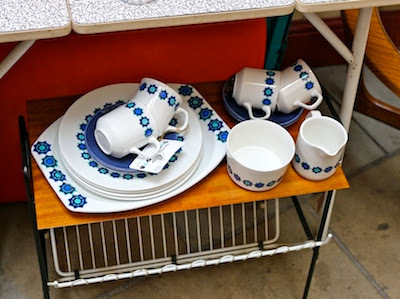 I was more impressed with the Sindy hostess trolley - £10.00 - in its original box! 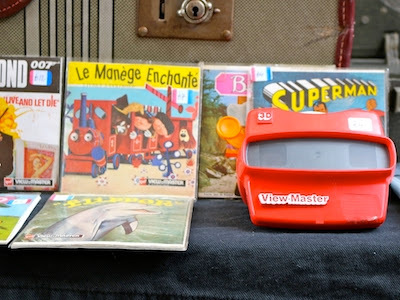 I'm a bit of a fan of View-Master, so was pleased to see a red View-Master stereoscope with an assortment of French reels on the We Used To Have One Of Those stall. You may recognise 'Le Manège Enchanté' (known to us Brits as 'The Magic Roundabout')! Pleased to meet our intrepid Finder of the Fair, Ruthy. 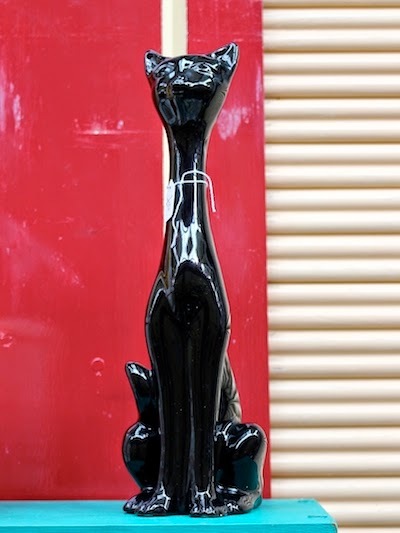 Vintage Queen had a very slinky and shiny black cat for sale. I hope he found a good home. Buttons are always tempting, and Vintage Clutter had a colourful selection this month. I particularly liked the frogs! 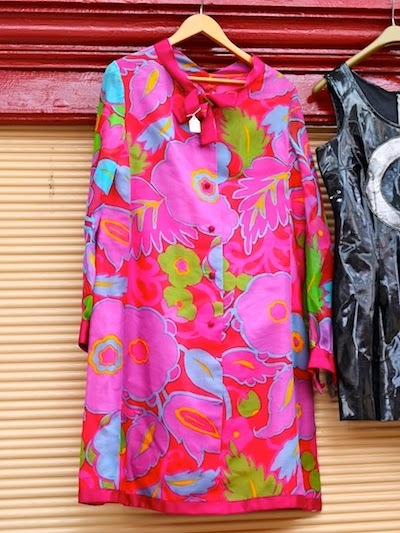 This 1960s silk dress was amazing. Such vibrant colours and very little sign of wear and tear. Sadly it wasn't the right size for me otherwise I would have bought it. 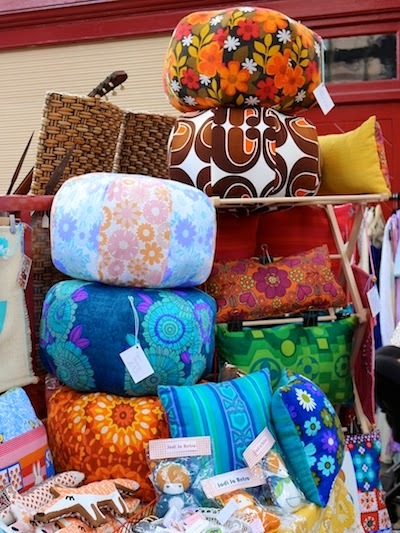 The Jodi Jo Retro stall was full of fantastic retro print fabrics, including this wonderful pile of pouffes! 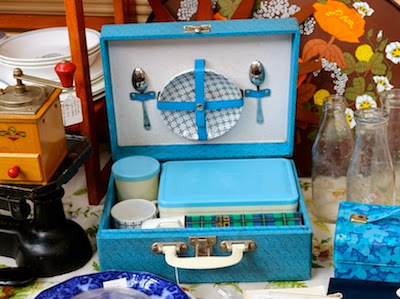 This wonderful turquoise picnic set was on All Our Yesterdays' stall. I was really tempted to buy this but my husband prefers modern plastic containers in a backpack! There was more Poole Pottery available at Aspidistra Vintage, including this pretty pin dish and bud vase. 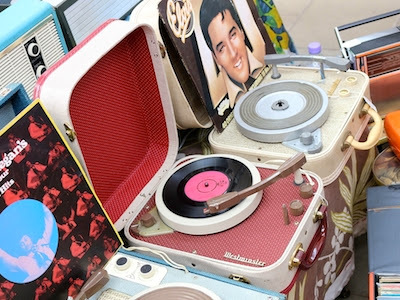 Andy Wilcox had an amazing selection of original portable record players. This Westminster record player was my favourite, and it sounded as good as it looked. I will be back next month with my birthday money to buy one of these! 'Snygg' is apparently Swedish for 'handsome, good-looking, cool, appealing', and there are always wonderful lamps and ceramics on Snygg's stall. 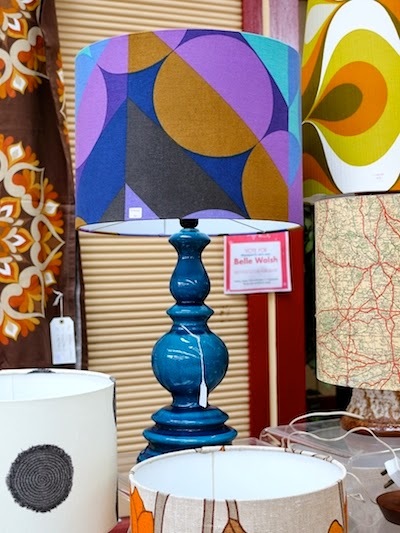 This time, my favourite was this beautiful blue lamp with a retro fabric shade. 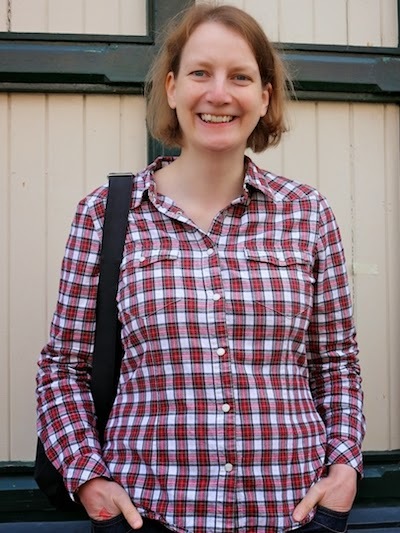 Our hearty thanks to Ruthy for sharing her highlights of the fair, every one of them is a winner!